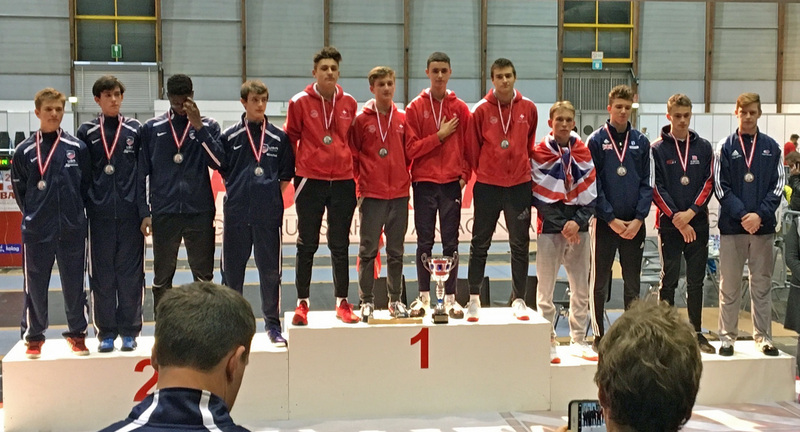 PLYMOUTH fencer Ben Andrews captained the Great Britain under-17 men’s A epee team to a bronze medal at the Klagenfurt European Fencing Tournament in Austria. The country’s lead epeeist was joined in the GB top team by Knightsbridge’s Josh Wilcox, Redhill & Reigate Epee Club’s Jacob Foulsham and his Plymouth Fencing Club team-mate Steven McPherson, who was reserve. The Great Britain A team – one of three sides the country fielded – went into the event ranked ninth out of the 38 sides and received a bye into the round of 64. After a convincing 45-23 win in their first direct elimination fight over Slovakia the team then went on to defeat Israel 45-34. A further victory over the Ukrainian B team (45-42) put the top GB side into the semi-finals. In a close called match, they narrowly lost out on a place in the final, going down 44-43 to USA B. In the subsequent fight-off for third spot against USA D, the British side triumphed 42-41 after starting the ninth period one point down. The team will travel to Finland later in the month where they hope to build on their recent success. In the women’s under-17 section in Klagenfurt, fellow Plymouth fencer Abagael Black was the youngest member of the Great Britain A team that finished 12th overall, while club team-mate Taylor Foxwell-Moss was part of the B team that finished 15th.